Thursday, February 28th: The lights go down. A gold backlight glows, revealing the silhouette of a well-dressed man poised in position. From seemingly nowhere a guitar picks up a rhythm. Drums and sound of hands clapping add to the beat. Suddenly the music rises and the man explodes into dance. His footfalls shake the room as he flies in a whirlwind; his dance so fiery and beautiful it takes your breath away. The next 90 minutes go on to be one of the most spectacular international dance performances ever seen at Bucknell. Farruquito is a living legend. Son of flamenco singer Juan Fernández Flores “El Moreno” and dancer Rosario Montoya Manzano “La Farruca”, Farruquito was immersed in the art of dance by his grandfather, “El Farruco”, one of the greatest dancers in the history of flamenco. 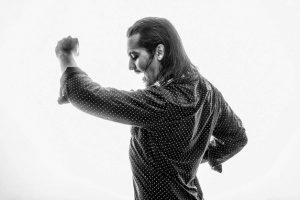 Today, Farruquito still possesses the grace of his grandfather’s movements while also embracing the theatrical side of flamenco dance. He has successfully built his style upon his grandfather’s legacy; respecting the traditions of flamenco while incorporating his own glamorous, spontaneous flair. His performance at the Weis Center was a testament to his rightful place as one of the world’s best Flamenco artists.